PRIDE IS THE SON OF HATTEN’S JEANIE, AND CH KEYSTONE’S WILDMAN GERONIMO, HE HAS REALLY TAKEN THE BEST FROM BOTH PARENTS. 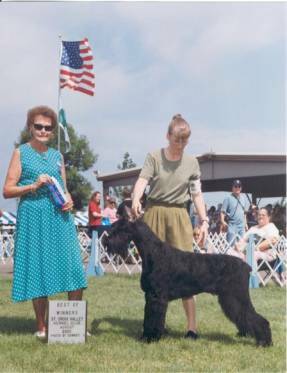 HE IS A LARGE BONED, SUBSTANTIAL DOG, BUT HAS THE ELEGANCE TO MAKE HIM A REAL SHOW DOG. HE STANDS ABOUT 28 ½ INCHES TALL, AND WEIGHS ABOUT 95 LBS. HE HAS A GREAT HEAD, TOPLINE, MOVEMENT OUT OF THIS WORLD, AND A PRESENCE THAT MAKES YOU NOTICE HIM. HE LOVES TO SHOW, AND IS VERY GOOD AT IT, IN HIS YOUNG SHOW CAREER HE HAS BEEN VERY IMPRESSIVE. WATCH FOR HIM IN THE NEAR FUTURE. HE IS OWNED BY LEO AND MARGARITE DENOSHEVSKY, AND IS A VERY EXUBERANT OUTGOING DOG.